Replacement Clapton coil heads are compatible with the Joyetech Cubis Atomizer and Joyetech eGo AIO. Clapton heads can be used under Variable Wattage only. Recommended working wattage: 8 - 20W. Note: The Joye eGo AIO is NOT compatible with temperature control coils such as Nickel. 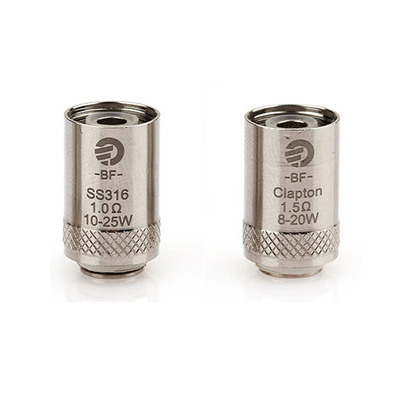 Replacement SS316 coil heads are custom designed for the Joyetech Cubis Atomizer and are also compatible with the Joye AIO. Those SS316 heads can also be used under VW, TC-SS, VT & TCR modes. Recommended working wattage: 10 - 25W.